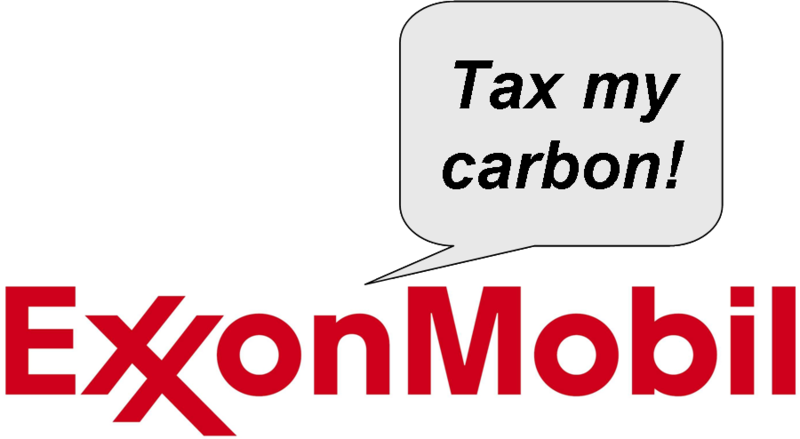 There’s a lot to like about ExxonMobil’s proposal to replace a portion of the income tax with a carbon tax—chiefly, that they proposed it at all. The center-left Brookings Institute has proposed a carbon tax, too. A carbon tax pressures stuff we don’t want (greenhouse gases) and eases up on stuff we do want (people working). The Brookings plan calls for a tax of $20 per metric ton of CO2-equivalent. They claim that’s enough to decrease greenhouse gas emissions by 20 percent of 2006 levels by 2050. Brookings also calls for a portion of the annual $150 billion revenue to be set aside for clean energy research and development. The rest would reduce income tax and the federal deficit. Exxon, which didn’t suggest a carbon reduction target, wants the carbon tax to be revenue-neutral. That is, it wants carbon tax revenue to be fought over in the future just like income tax revenue is fought over now. Republicans would continue to push for overall reductions, and no new revenues would be devoted to carbon abatement. Revenue-neutrality denies the urgency of the climate crisis. It might have worked in 1990. It can’t now. We’ve squandered the last twenty years increasing carbon emissions, thanks in part to Exxon and its fellow climate obstructionists and doubt-mongers. We now have to decrease them at more than twice the 1990 annual rate to get to 80% reductions by 2050. We need the set-aside that the Brookings Institute suggests to fund the research, development, and deployment of the systems—technological, economic, and social—that will structurally reduce carbon emissions. But the Brookings proposal of a 20% reduction by 2050 isn’t nearly enough. The ice cap will be gone long before 2050 unless we make much more aggressive cuts to carbon much sooner. All this suggests that we need a lot more money right now to make the transition away from carbon fuels. How do we get Exxon to agree to a larger tax that funds its own extinction? This transition is going to be expensive and painful for real and artificial persons alike. It will involve sacrifice, just as WW2 did. It is unavoidable. The alternative is a combination of the Great War, the Great Influenza Pandemic, the Great Depression, and Hurricane Katrina, worldwide until the end of time, possibly starting within a generation. The buyout doesn’t have to be 100 percent of present value or anywhere near it. Exxon has a big stake in reducing carbon emissions, too. What we think of as money is really just a representation of how much fossil fuel we control, so the worth of money will change as fossil fuel use becomes increasingly constrained. The Carbon Tracker Initiative is pressing companies to disclose their future exposure to carbon-linked revenue because their valuations are at risk as carbon reduction becomes more stringent. Exxon and all other fossil fuel companies have a big future liability. More than that, a world with no agriculture is a world with no markets for fossil fuel. Or anything else. Exxon is facing the same bankrupt future as the rest of us. Does revenue-sharing with Exxon sound unjust? Yes. But it’s less unjust than allowing the climate to spin into an irreversible feedback loop triggered by the disappearance of the Arctic ice cap. Once the ice cap goes, and the Arctic Ocean inverts from heat reflector to heat collector, the tundra will begin to melt. There’s an immense amount of carbon dioxide and methane in it. If those gases get loose, it’s all over except the rage, recrimination, and terminal suffering. A key part of the WW2 effort was the Marshall Plan. The hard lesson of WW1 is that vengeful reparations are self-defeating. The Marshall Plan rebuilt the economy of our enemies. We have a lot more to gain from facilitating the transition than from exacting retribution. After all, we’ve all benefited to date to some degree from fossil fuels. Our investments (the 401Ks we’re counting on in that carbon-constrained future) are all based on today’s fossil-fueled economy. Making Exxon a pure enemy when there’s potential common ground is cutting off our noses to spite our faces.